At Funtopia USA, a family fun center in Middle Village, N.Y., in the borough of Queens, a colorful redemption center is designed to catch the eye of players of all ages. Not only does Funtopia boast a slew of attractions, like Balladium, a fast-paced interactive ball-blasting game, and the Time Freak Playground, but also an arcade where everyone wants to get their hands on tickets to redeem for prizes. An air hockey table at Wilsonville Family Fun Center. Air hockey is still a popular choice at the center. Jason Vargas, general manager at Funtopia, said that while prizes add to the excitement of gaming, he actually sees gamers being most pleased at their wins and the prospect of tickets piling up as they play. “They see tickets piling up after hitting a jackpot and jump up with joy,” he said. It’s only later that the prizes really become the focus. To keep up with the momentum that the games themselves can create, the center is always adding new machines to the mix. “We like to keep our games fresh and our customers happy,” said Vargas. Some of the newer games include Star Wars Pod Battle, which he says is so new it’s a rarity on the market at the moment. Taking advantage of the recent Star Wars franchise frenzy, the game is extremely popular among players who remember the first trilogy of films, as well as a new generation of moviegoers. 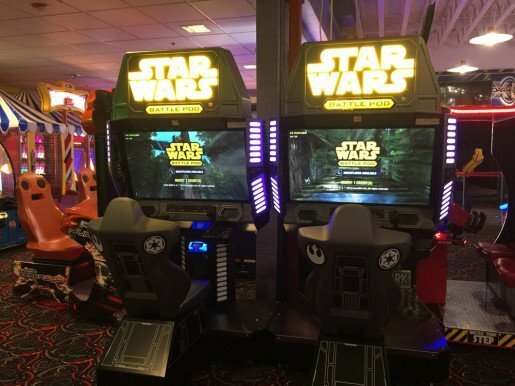 Star Wars Battle Pod games at Wilsonville Family Fun Center. Since the movie came out, Star Wars diversions are in demand at the center. Funtopia also sends at least one employee to a gaming convention every October to handpick new titles that will be released in the coming year. He said he wants to ensure that Funtopia, which needs to compete with other New York City attractions, keeps up with market trends and offers players some of the newest, most exciting games available. 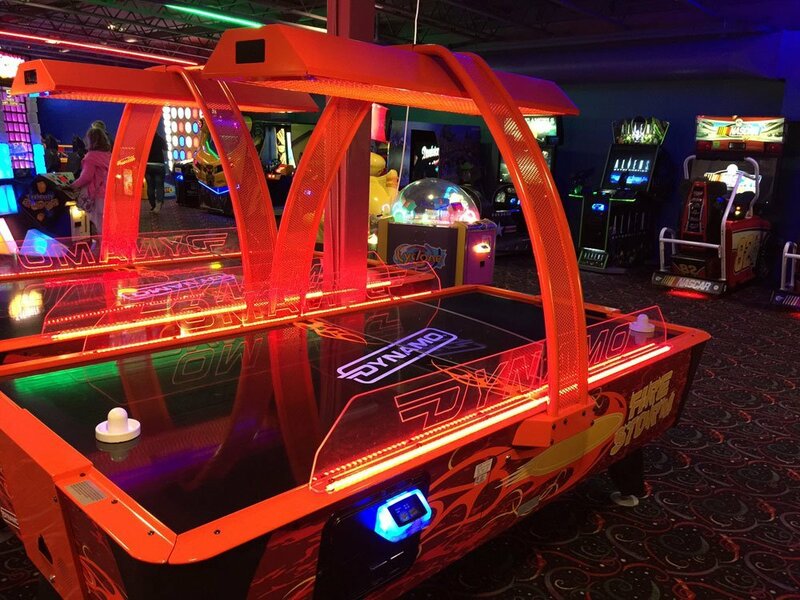 At Wilsonville Family Fun Center in Wilsonville, Ore., new games are added every year to keep the game room fresh, inviting and – perhaps most importantly – relevant. Darren Harmon, Wilsonville general manager said that this year, the most popular games are Grand Piano, Sponge Bob Pineapple and Quick Play. The arcade’s old standby Dynamo Air Hockey tables, which are in the process of being replaced, are also still quite popular, along with Angry Birds (a new movie comes out this summer), Crossy Roads, Galaga Assault, Full Tilt and Zombie Snatcher, which can accommodate up to six players. Zombie and classic-style arcade games are a big sell for teens and adults alike, as well as anything related to Star Wars. Harmon said Star Wars Racers has been a hit at Wilsonville ever since the new movie came out. 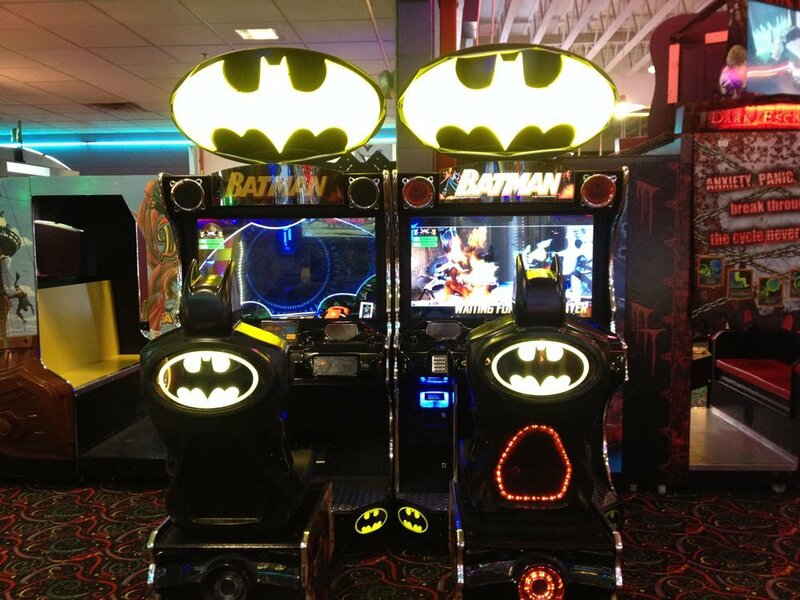 A Batman game at Wilsonville Family Fun Center. “We look to have a quick payback on any game we buy when it comes to redemption,” the center’s general manager said. Since the beginning, Castles N’ Coasters has been known for its massive indoor arcade that has attracted gamers from throughout the Southwest for the past 40 years. Today, the amusement park and family fun center in Phoenix has grown exponentially over the years, not only expanding its own attractions to include a new 3D motion theatre, three-story obstacle course and zip lining, but also adding locations in Tucson, and Ventura and Norwalk, Calif.
With the arcade located in a multi-level building with about 15,000 square feet of space, placing new games in high traffic areas is paramount to having the most eyes see them. Many game manufacturers are also developing games that are bigger and brighter than ever before. Features like LED lighting and large LED displays are becoming the norm. 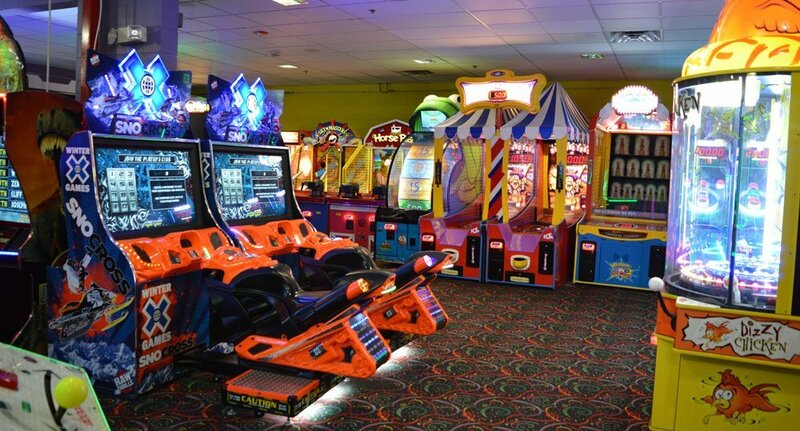 “Having these newer machines in areas of the arcade that will get the most foot traffic and visual noticeability will generate a higher return on investment,” said Homco, who makes his game selections based on a few different factors that read like a secret to success for any smart arcade operator. A lower level game room at Wilsonville Family Fun Center. Candy is a popular redemption prize choice at the center. “I am a big believer that a distinguished manufacturer that has years of experience in producing arcade machines will do so in higher quality, therefore games manufactured by the top companies will hold a slightly higher preference to me,” Homco said. Redemption games in particular are purchased mostly based on customer trends, like being able to associate a game with brand recognition and with popular products. “Nowadays people will gravitate towards a game they can relate to, such as Angry Birds and Flappy Tickets (which is now called Flying Tickets by Adrenaline Amusements),” he said. “Most redemption game manufacturers are developing games based off of popular cell phone applications, which causes people who frequent arcades to immediately relate to the games because they play on the app.” It turns out that being able to play a game on a smart phone is no detriment to wanting to play it in an arcade setting, especially if prizes are attached. Gamers, said Homco, are also drawn to titles with Hollywood star power. “Star Wars Battle Pod was a game I purchased last year right before the release of the movie and it has been earning very well,” he explained. Mario Kart Arcade GP DX has also been very popular, which he attributes to the familiarity with Mario characters dating back to the old Mario Kart Nintendo 64 game. With more than 15 years of experience in the business, Homco also looks for quality of craftsmanship. He said he wants to know upfront how much maintenance will be required for wear and tear, and if spare parts are readily available, which sometimes precludes him from selecting certain titles that may have appeal, but may also be expensive to operate. Another consideration: whether a user stands, sits or can interact with the game. The games here range from sit-down driver games to shooter and pinball games. “Generally arcades have a 70 to 30 redemption/non-redemption spilt nowadays because redemption games, which are ticket earning, will yield a higher profit,” he said. The arcade at Castle N’ Coasters currently features about 60 percent non-redemption and 40 percent redemption. Of the 150 games in total, the venue currently has 15 pinball machines and about 30 classic arcade games, such as Galaga, Pac-Man, Tetris, Mortal Kombat and Robotron – many of which are still in their original cabinets. And of the top 25 games, as many as 19 are redemption. “I’m given a yearly new game budget,” said Homco. “I keep abreast of what new games are being released via websites of manufacturers and trade shows, and I try to budget out which games I will get related to the amount of money available to spend.” He also considers how games have depreciated and those that must be replaced, all the while keeping an eye on the split between redemption and non-redemption. Because the center has a lot of regional competition, Homco checks out what games other centers are housing, and tends to buy those, too, mostly to keep customers from visiting other arcades. Prizes for the redemption counter are purchased similarly, said Homco. But about 75 percent of prizes that are redeemed by customer tickets are of the smaller variety and under a $1-$2 cost to the center. But he said product branding is very important to prize purchasing. Also important is having a variety of options for both boys and girls. Ideally, unisex prizes are the best. Big Bass Wheel is by far the most popular redemption game at Starlite Family Fun Center in Sharpsburg, Ga. Tara Henry, sales manager for Sharpsburg, as well as two in-state locations in Stockbridge and McDonough, said Wack and Win and Down the Clown follow a close second and third. As far as prizes go, Henry’s recently changed the way the redemption center operates. In the past, guests could pay the difference for a prize if they didn’t have enough tickets. But now, tickets and cash are no longer interchangeable. The goal is to encourage people to play more games to get more tickets to redeem more prizes.